Langley – While lake levels are slowly but steadily receding, following recent heavy rains and area flooding, the Grand River Dam Authority is encouraging the public to take extra precautions when visiting the water over Memorial Day weekend. Alberty said there is a likelihood that floodgates will be open at both Pensacola (Grand Lake) and Robert S. Kerr (Lake Hudson) dams during the weekend, so staying well clear of floodgate areas needs to be a priority for all boaters. For those who intend to visit the “rock crawling” areas below the Pensacola Dam spillway over the long weekend, Alberty said GRDA is anticipating that some of those areas will be accessible. However, due to release schedules and the possibility of more rainfall, the exact locations may not be determined until Friday. Whether you are on land or water, notifications such as signs, buoys, sirens, fencing and flashing lights are all intended to notify those in the area when floodgates are open, generators are operating or water is rising swiftly. 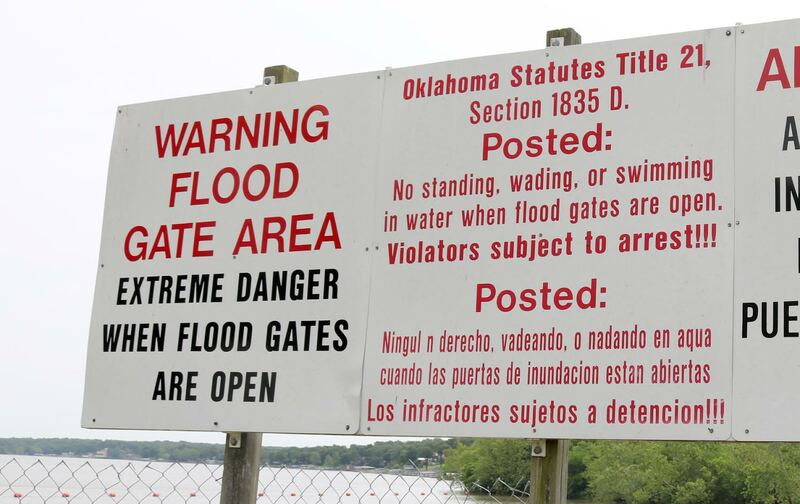 Signs: Posted at GRDA hydroelectric facilities to warn of extreme danger in floodgate areas. Please be aware of other signs near GRDA facilities that notify you of no trespassing areas, no diving areas, or unstable footing. Once again, the GRDA Police Department encourages you to enjoy your weekend on the water, just be sure to boat safe, smart and sober. For more information on GRDA, the GRDA Police Department and lake rules, visit the GRDA Police tab on grda.com or like us on Facebook. If you need immediate assistance while on the water, the GRDA Police encourages you to dial 911. If you don’t have a cell phone available on your boat you can also radio for help on Marine Band 16.